Seuss-Zyklus, auch Zyklus 208a genannt, von 180-210 (208) Jahren. 1.470-Jahreszyklus, vgl. Braun et al. 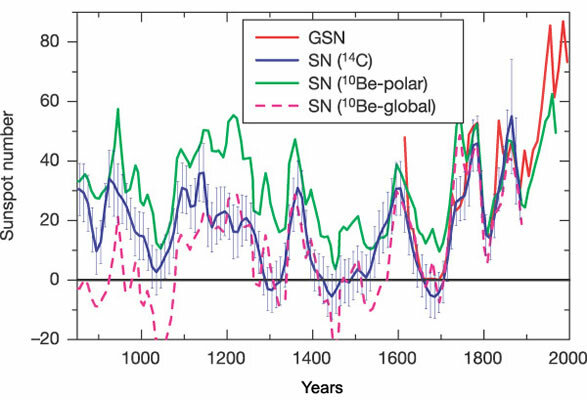 (2005) Possible solar origin of the 1.470-year glacial climate cycle demonstrated in a coupled model.- Nature 438: 208 - 211. Siehe auch: NASA, Solar Physics - The Sunspot-Cycle. Die verschiedenen Zyklen können sich überlagern und zeichnen sich selbst durch starke Schwankungen in ihrer Intensität aus. Abb. oben: "Aus C14-Daten rekonstruierte Sonnenfleckenzahlen (10-Jahres-Mittelwerte) für die vergangenen 11.400 Jahre (blaue Kurve) und die direkt beobachteten Sonnenfleckenzahlen seit 1610 (rote Kurve). Die verlässlichen C14-Daten enden 1900, so dass der starke Anstieg der Sonnenaktivität im 20. Jahrhundert dort nicht in Erscheinung tritt. Die Rekonstruktion zeugt deutlich, dass ein vergleichbarer Zeitraum hoher Sonnenaktivität mehr als 8.000 Jahre zurückliegt." Max-Planck-Gesellschaft - Presseinformation vom 27. Oktober 2004 - 4 S [date of access: 30.03.07] Vgl. Solanki et al. 2004 und nächste Abb. aus der gleichen Publikation, Original aus NATURE! "Unusual activity of the Sun during recent decades compared to the previous 11,000 years" by S. K. Solanki, I. G. Usoskin, B. Kromer, M. Schüssler and J. Beer.- Nature 431, 1084-1087(28 October 2004) doi:10.1038/nature02995. FIGURE 2. Comparison between directly measured sunspot number (SN) and SN reconstructed from different cosmogenic isotopes. "Plotted are SN reconstructed from Delta14C (blue), the 10-year averaged group sunspot number1 (GSN, red) since 1610 and the SN reconstruction14 from 10Be under the two extreme assumptions of local (green) and global (magenta, dashed) production, respectively. The slightly negative values of the reconstructed SN during the grand minima are an artefact; they are compatible with SN = 0 within the uncertainty of these reconstructions as indicated by the error bars. Delta14C is connected with the 14C production rate via a carbon cycle model21. The connection between the 14C production rate, R, and the cosmic ray flux is given by where theta is the colatitude relative to the geomagnetic dipole axis, and Pc (theta, M) is the local cosmic ray rigidity cutoff (which depends on theta and the virtual geomagnetic dipole moment, M)23. X(P, Phi) is the differential cosmic ray rigidity spectrum near Earth, Phi is the modulation strength describing the average rigidity losses of cosmic rays inside the heliosphere, Y(P) is the differential yield function24 of 14C, and P is the rigidity of the primary cosmic rays. For studies of long-term changes of the cosmic ray flux, the parameter Phi alone adequately describes the modulation of the cosmic ray spectrum X(P)11,24. The two most abundant cosmic ray species, protons and alpha-particles, are taken into account in the model13. The cosmic ray transport model relates R to Phi, which in turn depends on the Sun's open magnetic flux12. The open flux is linked with the magnetic flux in sunspots (and thus with the SN) via the source term in a system of differential equations9,10. The value of R is obtained from Delta14C and M is known for the whole interval of interest25,26, so that Phi can be obtained from the inversion of the equation given above. Error bars depict the 68% confidence interval for the reconstructed SN, which takes into account both random and systematic uncertainties." Abb. oben: Quelle / Source newscientist.com - Vgl. Sie auch: Solar and Heliospheric Observatory [date of access: 18.01.07] und die folgenden Abbildungen unten mit den Sonnenfleckenrelativzahlen zwischen 1600 und 2000 A.D.
Abb. oben: Die Zahl der Sonnenflecken schwankt in einem regelmässigen Zyklus von etwa 11 Jahren, welche in Gruppen auftreten (Gleissberg-Zyklen - 80-90 Jahre). Die Maxima sind unterschiedlich stark ausgeprägt. In der zweiten Hälfte des 17. Jahrhunderts war die Sonne fast fleckenlos (H.Wöhl, Kiepenheuer-Institut für Sonnenphysik, Freiburg, verändert und ergänzt nach Intellicast sowie University of Nebraska-Lincoln, Natural Resources)." Ursprünglich aus: Schmitt, D. & M. Schüssler (2002), S. 4, farblich verändert. Die Zyklen wurden seit ca. 1749 gezählt. Um das Jahr 2000 wurde der Zyklus 23 durchlaufen. Im März 2008 beginnt der Zyklus 24, welcher evtl. die gleiche Sonnenfleckenrelativzahl haben kann wie die Zyklen 3, 18, 21 oder 22. Andere Berechnungen gehen davon aus, dass 23 und 24 wohl ähnlich sein werden. Siehe unten! Abb. 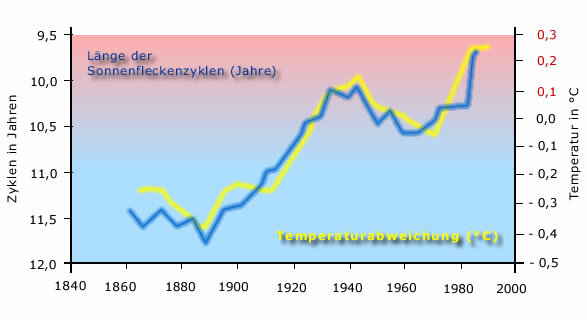 oben: "Die Länge der Sonnenfleckenzyklen zeigt eine auffallende Ähnlichkeit mit der Temperaturveränderung zwischen 1860 und 1980". Aus Friis-Christensen, E. & K. Lassen (1991), stark verändert und ergänzt. Beachten Sie bitte die Anmerkungen weiter unten. 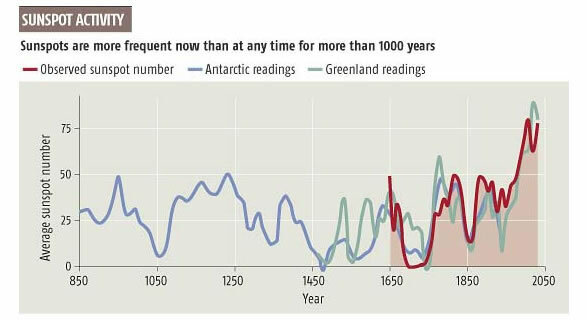 Willson, Richard C., and Alexander V. Mordvinov (2003) Secular Total Solar Irradiance Trend During Solar Cycles 21-23.- Geophysical Research Letters 30: 1199-1202. Lassen, K. (1997) Long-term Variations in Solar Activity and their Apparent Effect on the Earth's Climate.- Tekniske rapporter fra No. 97-11. Friis-Christensen, E. & H. Svensmark (1997) What do we really know about the Sun-climate connection? - Advances in Space Research, Volume 20, Issue 4-5, p. 913-921. Die Aussagen von Friis-Christensen und Lassen (1991) in Science sind mittlerweile umstritten und waren sicher sehr "ambitiöse Interpretationen" (Beer 2004, siehe oben!). Gleichwohl waren die Hinweise sehr wichtig und haben die Notwendigkeit weiterer Forschungen in diese Richtung deutlich gemacht. Mittlerweile hat es hier einige Korrekturen gegeben, die vor allem die Daten-Interpretation der letzten 30 Jahre betrifft (vgl. Lassen 1997, siehe oben!). Andererseits scheint heute kein Zweifel mehr dahingehend zu bestehen, dass wenigstens vor Mitte der 70er Jahre die Sonne eine entscheidende Rolle bei der Temperaturentwicklung gespielt hat. Damit wird die Bedeutung von CO2 für die "post LIA-Phase" stark relativiert (nicht negiert). Exogene Faktoren spielen aber offensichtlich eine weitaus grössere Rolle als von den Befürwortern der AGW-Hypothese bisher akzeptiert. Ganz generell kann man wohl konstatieren, dass die Wolkenbildungs-Hypothese noch auf sehr wackligen Beinen steht, obwohl sich die Hinweise mehren, wonach Wechselwirkungen existieren, die überhaupt nicht gut verstanden sind. Man darf gespannt sein, was z.B. die Heidelberger um Prof. Frank Arnold vom MPI für Kernphysik noch herausfinden. Eine populärwissenschaftliche Abhandlung finden sie hier: Henrik Svensmark & Nigel Calder (2008) Sterne steuern unser Klima.- Patmos, 251 Seiten, 24,90 Euro. "How does the variation in sunspot number (easy to see and measure) relate to variation in UV flux (the quanity that matters for atmospheric photochemisty)? This is a tricky issue - we have to develop "proxies" - quantities we can measure now and compare with the current UV output of the Sun and then go back to historic measurements (e.g. from rocks, icecores, tree logs, etc) of these proxies"
Laboratory for Atmospheric and Space Physics, University of Colorado at Boulder: LASP over longer periods of time. Wie Ende des 20. und zu Beginn des 21. Jahrhunderts ein sogenanntes "Modernes Minimum" herausgelesen werden kann, ist nicht so leicht nachzuvollziehen. Zyklus 23 (siehe oben!) zeigt bestenfalls eine Abschwächung auf hohem Niveau. Vgl. Solanki et al. (2004), MPG 2004 und auch die nächste Abb. des LASP mit der TSI (Reconstructed Total Solar Irradiance). Im übrigen müsste dann wesentlich eher von einem "Minimum" um 1900 (Krakatao-Ausbruch) gesprochen werden. Um ein Minimum im eigentlichen Sinne, d.h. ein Minimum solarer Aktivität, handelte es sich aber mitnichten. "After accounting for the increase in CO2 and other greenhouse gases, the Earth’s surface temperature corresponds with the increase in solar radiation, except during major volcanic eruptions"
The periods of warming shown above also coincide nicely with the stronger eleven year solar cycles shown (above). 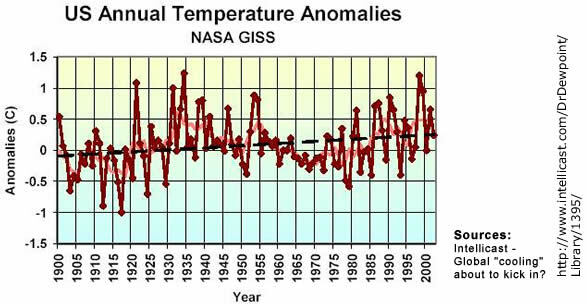 The cooler periods during the last one hundred years or so correspond with the weaker solar cycles of the last one hundred years. Thus it seems that the sun is a factor in the global temperatures and the stronger cycles of late may be a significant factor in recent global warming." Abb. oben: "According to their analysis (Hathaway and Wilson's prediction for the amplitude of Solar Cycle 24), the next Solar Maximum should peak around 2010 with a sunspot number of 160 plus or minus 25. This would make it one of the strongest solar cycles of the past fifty years—which is to say, one of the strongest in recorded history. These results are just the latest signs pointing to a big Cycle 24. Most compelling of all, believes Hathaway, is the work of Mausumi Dikpati and colleagues at the National Center for Atmospheric Research (NCAR) in Boulder, Colorado. "They have combined observations of the sun’s 'Great Conveyor Belt' with a sophisticated computer model of the sun’s inner dynamo to produce a physics-based prediction of the next solar cycle." In short, it's going to be intense. Details may be found in the Science@NASA story Solar Storm Warning." (2) storms caused by the more forceful impact of flares and coronal mass ejections (CMEs). "Only the first type has predictive value," says Hathaway. "Storms caused by solar wind streams come and go in a regular pattern that foretells the solar cycle. Storms caused by flares and CMEs don't have this property." To improve their results, Hathaway and Wilson used a technique developed by Joan Feynman to remove storms caused by flares and CMEs from their data. Hathaway, D. H. and Wilson, R. M. 2006, "Geomagnetic activity indicates large amplitude for sunspot cycle 24", Geophys. Res. Lett. Quelle: Science@NASA - Scientists Predict Big Solar Cycle vom 21. Dezember 2006. Dort auch weitere interessante Auswertungen. On the other hand, they will have to worry more about cosmic rays. Cosmic rays are high-energy particles from deep space; they penetrate metal, plastic, flesh and bone. Astronauts exposed to cosmic rays develop an increased risk of cancer, cataracts and other maladies. Ironically, solar explosions, which produce their own deadly radiation, sweep away the even deadlier cosmic rays. As flares subside, cosmic rays intensify—yin, yang. Hathaway's prediction should not be confused with another recent forecast: A team led by physicist Mausumi Dikpata of NCAR has predicted that Cycle 24, peaking in 2011 or 2012, will be intense. Hathaway agrees: "Cycle 24 will be strong. Cycle 25 will be weak. Both of these predictions are based on the observed behavior of the conveyor belt." Science News, (June 9, 2008) The sun has been lying low for the past couple of years, producing no sunspots and giving a break to satellites.
" That's good news for people who scramble when space weather interferes with their technology, but it became a point of discussion for the scientists who attended an international solar conference at Montana State University. Approximately 100 scientists from Europe, Asia, Latin America, Africa and North America gathered June 1-6 to talk about "Solar Variability, Earth's Climate and the Space Environment."